I have been trying to prayerfully puzzle my way through the meaning of the beast with seven heads in Revelation 13. It’s an interesting study and before I got too far, I found myself going back to Daniel 2, 7, & 8, along with Revelation 17. Revelation 13:1 states, “And the dragon stood on the sand of the seashore. Right away we see a picture of the dragon – Satan – standing on the seashore. As he stands there, a beast comes up out of the sea. The implication here is that Satan calls this beast forth. The beast is said to have ten horns and seven heads. Each horn has a diadem or crown. Each of his heads has blasphemous names written on them. If we consider the ramifications of this passage, it will likely instantly remind us of Daniel 2, 7, and 8. 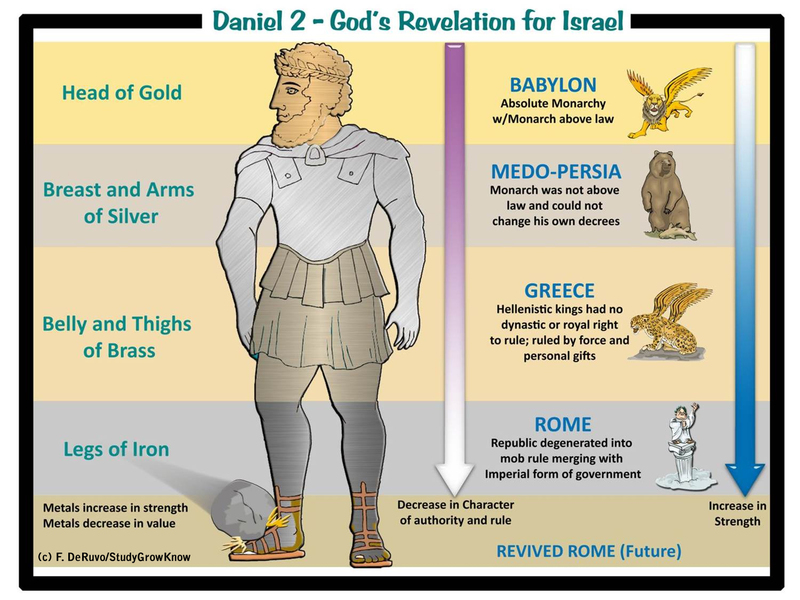 There, we learn about the statue that Nebuchadnezzar saw (Daniel 2) and how parts of that statue were made of different materials. Later on, we learn the meaning of them and in Daniel 7 and 8, we learn even more specifics. If you click on the image(s), it will open in a new window in a much larger format. As you can see, the first image highlights the statue that Nebuchadnezzar saw in his dream and which Daniel interpreted for him. 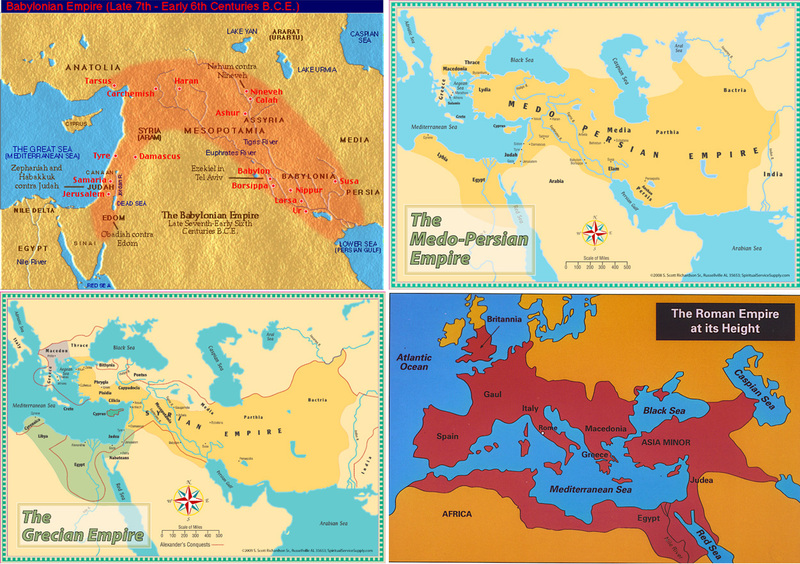 The second image highlights the same information from a different perspective but also adds secondary information about the same empires along the bottom of the image and adds information pertaining to the four generals that took over for Alexander the Great after he died. 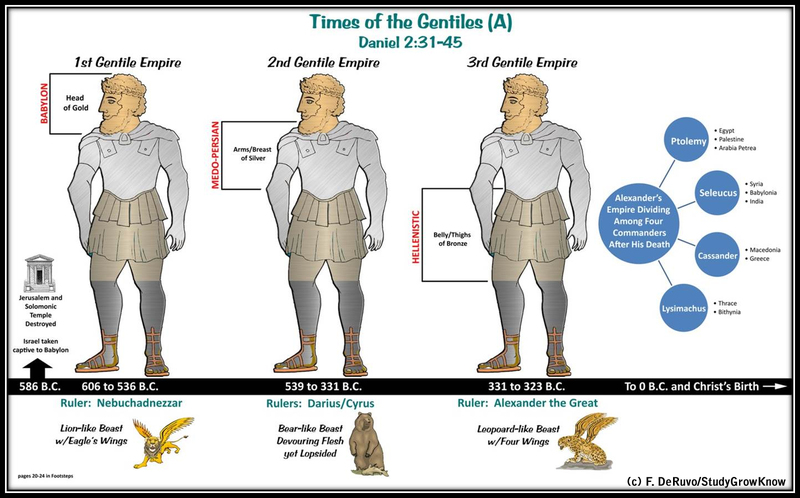 Eventually, the empire that broke into four pieces (Daniel 7:6 notes that these are four “heads” and in Daniel 8:8, we read about four horns) is overtaken by what became known as the Roman Empire. We are essentially talking about the same area of the world with more land added to it for one empire and land taken away for another. But in general, the same area of the world is in view for all of these empires. These empires are important because of the fact that they are part of prophecy and they essentially replace one another, as one empire segues into the next. What is truly interesting here is because these empires occurred in essentially the same area of the world – which turns out was the birthplace of civilization – even though a new king or emperor came on the scene, if we stop to consider it, one empire simply folded into the next. 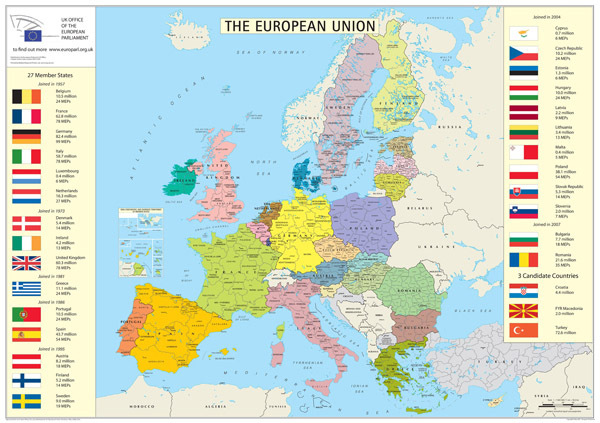 Here we are in 2013 and we have seen the rise of the European Union. There has been talk of a North American Union as well, which would incorporate Canada, America, and Mexico. No wonder our current and previous administrations don’t want to build a wall or fence on America’s southern border. They would only have to take it down later. In essence, whether the EU eventually segues into the renewed Roman Empire, or something else comes along to take that place in future history, what we are seeing is that the Roman Empire never really vanished. The EU encompasses at least some of the geographical area that the Roman Empire once did. There was also an idea that the previous president of France was floating called the Mediterranean Union.This union – the MU – is larger and incorporates more of the old Roman Empire. What does this all mean? It means that the fourth beast of Daniel 2, 7, and 8, as well as Revelation 13 and 17 did not completely die. It simply went somewhat dormant and we will get into this in more detail in our next article. One thing that is important and I will leave with you is the ten horns that are mentioned in Revelation 13. Those horns – in my opinion – represent individual kings. It seems clear that the point in future history when the world arrives to the point where ten “horns” or kings rise up to control and rule the world, it will be the second to the last stage of human history. The very last stage is when Antichrist rises from among those ten kings, allowing Satan one final chance to rule the world in his attempt to prove that he can make something of himself. By the way, all of this so far has been made possibly by a global elite that rules much of the world now from the shadows. The governments that are in place now, for the most part, are merely for show. They support the belief for the average person that our governments exist and they work for us. In point of fact, the global elite has been using the governments of the world (and for the past 100 or more years, the government of America especially, to make their political as well as material gains from other countries. Join me next time when we get into the seven heads and ten horns more deeply. It’s really a fascinating study! Entry filed under: Religious - Christian - End Times, Religious - Christian - Prophecy, Shadow Government.